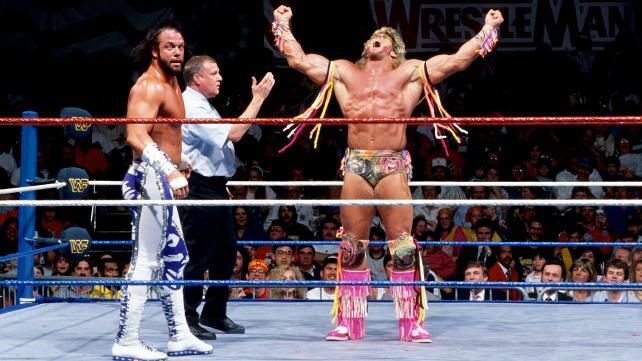 It was a match where careers were on the line as The Ultimate Warrior battled the “Macho King” Randy Savage in one of the biggest matches at WrestleMania 7 in 1991. The Ultimate Warrior was the WWE Champion heading into 1991. He won the title at WrestleMania 6 the previous year. Savage was an upper midcard heel with Queen Sherri as his manager. When Warrior defended the title against Sgt. Slaughter later at the Rumble, Savage made his way to ringside and cracked Warrior in the head with the scepter. Slaughter beat Warrior for the title thanks to Savage’s interference. That set up the WrestleMania match. It was billed as the first ever Career vs. Career match in WWE history. I’m not sure if it was true, but it was the first one I could remember seeing as a kid. The storyline wasn’t that elaborate looking back on it. However, Warrior was a top face and Savage was a top heel, so to a lot of people this was the true main event of WrestleMania. It was certainly a way better match than Hogan/Slaughter was. I can remember being a nervous ten-year-old kid watching this match because Randy Savage was my favorite wrestler. I didn’t care that he was the bad guy Macho King. He was my guy and I rooted for him no matter what. I’m pretty sure we watched this at a cousin’s house and I was clutching onto one of those Randy Savage action figures the whole night hoping he was going to win. You have to understand that when you’re a kid and you hear one guy has to retire after the match it’s something you believe to be true. We didn’t know how wrestling worked. To me, it meant that if Savage got beat then he was done forever. I can’t remember my emotions going into it now, but I was probably nervous. Warrior was always a guy that I thought was cool. He was never my number one guy, but it was hard not to like him due to his cool look, the energy he brought to the ring and of course the face paint was fantastic. Here’s my full review of the match, which was written in 2012. They showed the events leading up to the Ultimate Warrior-Randy Savage match. The announcers set up the match. Gorilla pointed out it was the first ever Career vs. Career match. Heenan pointed out that Elizabeth was sitting in the crowd. Savage was still a heel here, managed by Queen Sherri. Savage made a grand entrance. Warrior didn’t run to the ring for a change. Heenan questioned it, wondering if he was too worried about the match. The crowd was very loud from the beginning. Savage was booed for the most part while Warrior was cheered loudly. They did a lot of shots of Elizabeth in the crowd. Warrior hit a clothesline early followed by a two handed choke and an inverted atomic drop. Then he hit a regular atomic drop. He went for another two handed choke, so Sherri ran in the ring and Warrior threw Savage into her, sending her to the floor. Savage came back with a kick to the face followed by a left handed clothesline. To the top, Savage went for a crossbody. Warrior caught him, stood him on his feet and slapped him in the face. Savage threw a chair into the ring, the ref took care of it and Savage’s attack on Warrior failed because Warrior was ready for it. While Warrior kicked him in the corner, they showed Elizabeth in the crowd once again. Warrior whipped him in the corner, Savage moved and Warrior went crashing into the turnbuckle, which sent him to the floor. Savage hit him with the double axehandle off the top rope. Sherri attacked Warrior on the floor, so he shoved her down to the mat. Savage threw Warrior into the post. Back in the ring, Warrior got a backslide for two. Savage spit on him, then he bailed to the floor and Sherri distracted Warrior again. Savage’s boot got caught. Warrior hit a clothesline to knock him down. Warrior missed a shoulderblock that was never going to hit. Savage put him in a sleeper. Warrior fought out of it, hit a shoulder block and then they did a double clothesline spot that sent both guys to the spot. Nice breather there since the match was fast paced to this point. Warrior got a small package. Sherri distracted the ref, so by the time the ref got over there he only got a two count. Savage hit his patented knee to the back that caused Warrior to accidentally knock the ref over. Savage held Warrior for Sherri, who attacked with her shoe. Warrior moved, so she hit Savage. Warrior followed her around the ring. When he got back in, Savage rolled him up for a two count. Savage worked on the throat, ramming him into the turnbuckle and then draping Warrior’s throat across the top rope. Savage continued the assault, working on the neck of Warrior with a clothesline to the back of the head and a bodyslam for two. Savage went to the top rope and he hit the Flying Elbow. He went up again and hit Flying Elbow #2 to the throat of Warrior. Savage went up again for Flying Elbow #3. That one connected too. Savage hit Flying Elbow #4. That was the best looking one of them all so far. Savage hit Flying Elbow #5. Finally he covered Warrior, everybody thought that was it and Warrior was able to kick out. Savage had a shocked look on his face. It was rare for anybody to kick out of the Flying Elbow, so for Warrior to kick out of five of them was a big deal. Savage attacked with punches, but Warrior made his way to the ropes and got his energy back. He decked Savage with punches followed by three clotheslines. Elizabeth was worried. Warrior picked him up for the Gorilla Press Slam. He ran the ropes and hit the big splash to the back of Savage. One…two…NO! I remember thinking that was it. That’s one of the best nearfalls ever. It was rare for anybody to kick out of finishers. In this match it happened twice. Following that nearfall, Warrior looked up to the Gods wondering if this was it for him. The idea was that he was looking for an answer to know if this was the end of his career. Warrior was goofy, so it was hard to make sense of his storylines. Warrior stepped through the ropes as Monsoon figured that this meant he was leaving. Savage was still down, trying to get to his feet. He punched Warrior in the head, knocking him to the floor. Sherri held Warrior’s throat on the steel barricade, Warrior shoved her away and when Savage jumped he missed, so he crashed throat first on the barricade. Warrior rolled him back in the ring. Warrior hit the flying shoulderblock that Gorilla called a clothesline. It’s okay Gorilla I still love ya. The shoulderblock sent Savage to the floor, so Warrior had to put him back in the ring. Warrior hit him with another flying shoulderblock that sent Savage to the floor once again. Warrior hit another flying shoulderblock. He pulled Savage back to the center of the ring, put his foot on Savage’s chest and the ref counted the pinfall at 20:48. Analysis: ****1/2 One of my favorite matches ever. This match had the perfect combination of in-ring action, storytelling within the match, kicking out of big moves at points where you thought the match would be over and it ended it with a decisive win for the victor. I didn’t always like Warrior winning with three shoulderblocks, but Savage did such a good job of selling them as if he was knocked out that they worked. While Savage was the better worker of the two, without question, this wasn’t necessarily a carry job on his part. Warrior did a very good job as well. The match was laid out very well, as all major Savage matches were, and the proof of that was evident in the quality of the match. It’s one of those matches that holds up well over time too. A lot of basic wrestling moves were done, but it was mapped out in the perfect way. I love this match. Post match, more drama. Sherri yelled at Savage for losing because it meant that her career was over too…at least in theory. She began to kick away at an injured Savage. While that was happening, Elizabeth looked on with a look of concern and she sprinted down to the ring! She grabbed Sherri by the hair and threw her out of the ring. Elizabeth went to help Randy, he threw his hand up thinking it was Sherri. When he turned around, he was shocked to see Elizabeth, not knowing that she was there. Bobby Heenan was yelling that everybody was standing in the building. You could see that a lot of them were. Elizabeth was crying. “She loves him!” Heenan was yelling. “I think he loves her! This is sickening!” Heenan rules. Then they embraced in the ring. The crowd cheered. Monsoon: “What a woman. And what a man!” Savage put her on his shoulder. They showed fans in the crowd that had tears in their eyes. Elizabeth was crying too. I bet Vince McMahon was elated when they got those shots of the crowd. Instead of Elizabeth holding the ropes for Randy, he held the ropes for her. Then he saluted the crowd. They cheered loudly thinking that this was his last match. He posed for them. They gave him a standing ovation. Perfect storytelling. Analysis: That was how you tell a story. Savage was one of the biggest jerks in wrestling for over two years. This was the reunion everybody wanted to see with Randy returning to his babyface ways and reuniting with the lovely Elizabeth. I’m sure it likely brought in a lot of women viewers too because it had that soap opera style feel to it. I can remember being so sad because I was almost 11 years old at the time thinking my favorite wrestler Randy Savage would never wrestle again. Later in the year, Savage & Elizabeth got married (they already were married in real life) and he would be reinstated, but during this moment I was devastated because I thought this was it for the Macho Man. Thankfully he had more matches in him. You can read my full recap of WrestleMania 7 right here. Here’s The Ultimate Warrior talking about the match among his favorites in in 2014. The first thing that comes to mind is sadness because Savage, Warrior, Sherri, Elizabeth have all passed away. They did such a fantastic job in this match and I hope that they’re all in a better place now reminiscing about how incredible this was. I think Savage likely put the match together move for move. He was notorious for scripting his matches move for move and that’s likely what happened here. Warrior was not known for having great matches while Savage was the best in-ring performer in WWE for the late 1980s into the early 1990s. As I said in the analysis, it was not a complete carry job by Savage because Warrior did his part well. His selling was good for the most part (until the no selling after the elbow drops) and everything they did was believable. This is one of those matches that I would show a casual fan to try to explain to them how much fun there can be in professional wrestling. The story carried this match both in terms of two guys fighting for their careers and what happened after the match with Elizabeth reuniting with Savage after the match was over. How many wrestling angles lead to people crying in the audience? It doesn’t happen, but it did here. Warrior had a tumultuous 1991. In the summer of 1991, he got into a big contract dispute with Vince McMahon and ended up leaving the company. Warrior returned at the WrestleMania 8 to save Hulk Hogan from a heel attack. The feud with Savage was rekindled at SummerSlam 1992 with Warrior getting the win by countout when Savage was the WWE Champion. In late 1992, Warrior was gone again. Savage was retired for most of the rest of the year. The fans were so happy that he was back with Elizabeth that they wrote letters hoping that he would be re-instated. It led to a Savage wedding with Elizabeth at SummerSlam 1991 even though they were married in real life several years earlier. Savage was cleared for action in late 1991 as a face and had a memorable feud with Jake Roberts. At WrestleMania 8, Savage won the WWE Title from Ric Flair, which is a match I covered earlier. It was one of the best matches from the first ten WrestleManias. The match took place 26 years ago and it holds up very well. They did a lot of simple things in terms of building to the finish, using Sherri for interference, having Savage come close to winning and Warrior making the superman comeback to leave as the winner. This match will always meant a lot to me. It’s not in my top ten WrestleMania matches ever, but it’s one of my favorite matches of all time. No doubt about that.